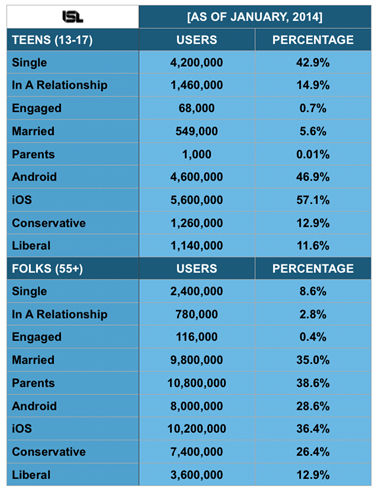 This information displays that most teens are single and most 55+ folks are married/parents. There’s no surprise there. It also shows that iOS seems to be the most popular device that Facebook is used through. What can we make of this information? 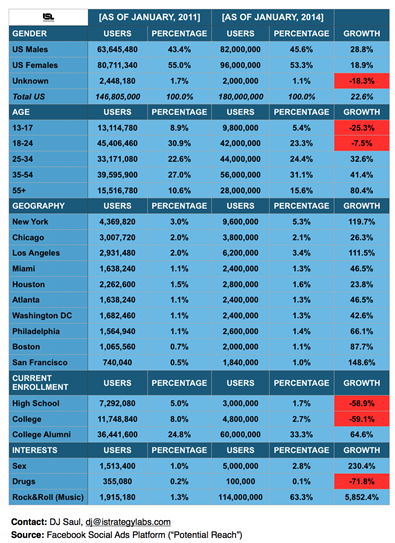 Is Facebook starting to slowly appeal more to the older people instead of the teens? Is Facebook doing this on purpose, or are just teen leaving Facebook so they can focus on studies? The reason is unknown, but what we do know is that if this trend continues in the same pattern, there might not be any teens left on Facebook in 2020! The reason they are leaving is because it’s no longer en vogue to use Facebook. Can’t anyone realize that? Between Facebook constantly changing their service to accommodate more advertising/info mining and their parents/family getting on the service and commenting/spy on their kid’s activities, the teens are going elsewhere to talk. Social media is a flash in the pan anyways. People are getting wiser about posting certain info and are starting to take back their privacy. Anyone remember MySpace? How about when the internet was run by giants such as AOL and Yahoo? Google, Facebook, and the rest will fall in time. I completely agree with you. It’s almost like they are trying too hard, and yes, privacy is huge with Facebook. Teens simply are going elsewhere as you meantioned. No wonder why snapchat, instagram and twitter are becoming popular, because parents don’t use them as much!